Creative 360 will once again showcase the wisdom and experiences of people over 80 in our annual Yes We Can! program. The nonprofit launched the innovative program six years ago as a way to engage with, and learn from, this dynamic group of seniors who have a wealth of experience and knowledge to share. In the past six years, more than 300 Great Lakes Bay artists, scholars, scientists and community leaders have been honored as they encourage and motivate us all to be more active, contributing community members at every age! 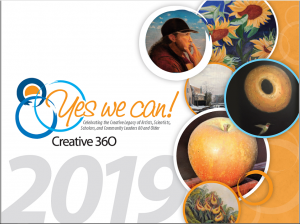 This year, the program honors more than 60 Great Lakes Bay artists, scientists and community leaders who will be featured in 23 Yes We Can! events taking place through May. The events include an art exhibition through February 17, ten Tuesday Tributes, eight Luncheon Soirees, and new this year, four Yes We Can! Evenings. Go to becreative360.org to access the complete Yes We Can! schedule. A print brochure is also available by calling 989-837-1885 or stop by to pick up your copy. Creative 360 is grateful to The Barstow Foundation, NADA Northwood University, and Space Studios for their sponsorship of this program. If you know of someone who is at least 80 who should be considered as part of future Yes We Can! programs, please contact Creative 360 at 989-837-1885 or by email at creed@becreative360.org.